Beau MacVane, who stands 6-feet 4-inches tall, is about as tough a person anyone will ever meet despite the fact he can no longer walk on his own and his speech is slurred. Beau MacVane’s two brothers help him cut the ribbon to kick off the Walk to Defeat ALS in Jupiter, Florida. MacVane has ALS (amyotrophic lateral sclerosis), a progressive, neurodegenerative disease. He represents the face of The Association’s new national “ALS Across America” campaign during ALS Awareness Month in May. A former Army Ranger, MacVane was diagnosed with what is commonly referred to as Lou Gehrig’s Disease on April 5, 2007 after returning home from the Middle East. This most cunning of opponents strikes military veterans anywhere from 60% to 100% more than non-veterans. The diagnosis came as a complete surprise to MacVane as it did to the 30,000 people in this country living with the disease and are shocked to learn they have on average two to five years to live. 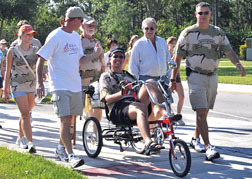 Beau MacVane pedals the Walk to Defeat ALS course with hundreds of his supporters. “I felt alienated from the world without knowing what the future would be like,” MacVane said. MacVane’s mettle is being tested like never before, and that is saying a lot. The 31-year-old former college football player did five tours of duty in Iraq and Afghanistan. He received unit citations and numerous battle awards and recognitions for his bravery. MacVane is one of the many men and women in this country who The Association is recognizing. These courageous individuals with ALS and their caregivers are role models to people with ALS. They are special individuals who reflect the spirit of the organization as they make a positive difference in their community by expanding awareness of ALS and embodying the spirit of living life to the fullest. Throughout ALS Awareness Month, The Association and its nationwide network of more than 100 affiliates will reach out to communities across the country to educate the public about Lou Gehrig’s Disease and urge people to join The Association in the fight to make ALS a disease of the past. National ALS Awareness Month activities include proclamations issued by cities and states. The annual National ALS Advocacy Day and Public Policy Conference, which is part of National ALS Awareness Month, has grown to be the single largest gathering of the ALS community and will be held this year May 11-13 in Washington, D.C. People with ALS and families from across the country travel to the Nation’s Capitol to tell their stories in meetings with nearly every member of Congress, advance The Association’s public policy priorities, educate Congress about the true nature of this disease, and let them know why more must be done in the fight for a treatment and cure. 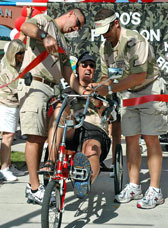 There is no camouflaging the fact that MacVane’s greatest and sadly perhaps his last mission is to bring about as much public awareness of ALS as possible with the time he has left and to generate money to fund ALS research. MacVane is not taking the disease laying down, an attitude that his family, who are his caregivers, and his many friends, admire about him. They will never need a drill sergeant to motivate MacVane. Determined not to let ALS beat him, MacVane, an environmental technician for Palm Beach County’s Department of Environmental Resources Management, established a work out regime for himself. He set up a rope course in his backyard. He clips himself to the top rope and then painstakingly uses his arms to walk the course. He does it for over an hour. He also purchased a Coast Guard life jacket and swims in his pool every day. He even built a 240-gallon aquarium. And when he’s finished exercising for the day, there are many other projects to begin and complete. MacVane and his family participated in The Association Florida Chapter’s Walk to Defeat ALS this year. He formed three huge teams for the Jupiter Walk: Beau’s Platoon, Team MacVane, and Falcon Battalion. Together with the 200 people he brought to the event, he raised well over $20,000. “It’s concerning to see a young man who fought for freedom being robbed of his own freedom. Beau is a hero in our eyes because he is now fighting a war after the war. We want to recognize his courage and bravery in his battle against ALS,” said Dara Alexander, president of The Association’s Florida Chapter. One of MacVane biggest supporters is chapter board of directors member Leland Talcott who quickly concluded that MacVane was an amazing person when he met him for the first time. The two appeared on a local TV show together. 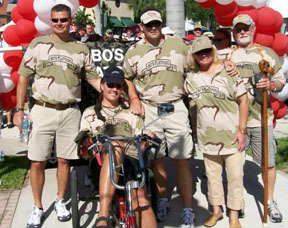 Beau MacVane at the Walk to Defeat ALS with several members of his “Bo’s Platoon” team. “He is without a doubt the toughest, most dedicated ALS patient I have ever seen,” said Leland Talcott, a member of the Florida Chapter of The ALS Association’s Board of Directors. Talcott, whose mother suffered from ALS, has become close with MacVane. Although he cannot pinpoint how he developed ALS, MacVane is sure about one thing: he is proud to have served his country, just like his grandfather did during WWII, his dad in Vietnam and his older brother during the Somalia conflict. To learn more about how this fatal neurodegenerative disease is striking at our nation’s heroes the hardest, read (ALS in the Military: Unexpected Consequences of Military Service).